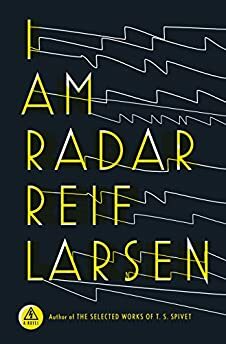 Largehearted Boy: Book Notes - Reif Larsen "I Am Radar"
Book Notes - Reif Larsen "I Am Radar"
Reif Larsen's novel I Am Radar is beautifully written and ambitiously told. "Strange things happen when Radar Radmanovic is around… If Larsen's story makes demands of its readers, it also offers plenty of rewards. Imaginative, original, nicely surreal." I Am Radar takes place in a wide array of places, none of which I'm from. This was at first a bit daunting, as I knew I lacked the local's knowledge of the minute contradictions that add up to a sense of belonging. I couldn't comment on the subtle history of pastries in this little Bosnian hamlet, or the intense Norwegian vocabulary around the quality of light. But what I did have was my outsiderness, which actually liberated me to some extent. And songs became my way in. I would listen to a song from a particular region and sonically inhabit its core. I would then try to recreate the emotional ecology of the song on the page. These tunes became like little wormholes into the soul of the story. Like little crib notes for me. Almost all of these songs are actually referenced directly in the novel, so I give the corresponding page numbers here. (from p. 92) The Muppets are very close to the source for me. Much of my narrative sensibility comes from the zany brilliance of that show, which even as a child you could tell was resonant for both adults and children alike, and thus the show secretly introduced you to what being an adult was like, and not just any adult but an empathetic adult with a sense of humor. Obviously since I Am Radar concerns puppetry, the book owes a good deal to Henson's legacy, as one of the characters in the novel, Leif Christian-Holtsmark, openly admits. But beyond this apparent modal connection, Milne's poem itself is oddly quantum ("Halfway up the stairs/Isn't up/And isn't down.") and the beautiful certain/uncertainty posed by its young narrator was a tone I was trying to strike throughout the book. On a slightly unrelated note, I always imagined Robin growing up to be this very screwed up frog, with lots of emotional problems as a direct result of being ignored by his manic extended family, despite the best efforts of uncle Kermit. (p. 102) "Trying to live without your love is one long sleepless night/Let me show you, girl, that I know wrong from right." I actually had these lines in a late stage draft of the novel before realizing they would probably charge me an arm and a leg for the pleasure. But I like how in the book Michael Jackson's voice appears out of the great spectrum of radio static at the north pole, as if the song is just constantly playing up there; it has become as elemental as the molecules of the thinning ozone. And Kermin grabs onto the signal for a second, gets that beautiful MJ medicine before the frequency quickly evaporates. A fleeting moment of perfection in the northern territories. MJ himself is a brother (and I mean this in the cosmic sense) of Radar as each undergoes their journey towards a paler shade of black. (p. 184) Two old songs—one from a battle with the Ottomans in 1804 and the other from WWI—which were both reappropriated to take on new nationalist significance during the Yugoslav wars of the 1990s. This region and that conflict is incredibly complex, but in order to make any headway you must understand the necessary repetition/reuse/requisition of history by its various players. A battle fought 600 years ago can become such a powerful signifier that people will take up arms in its name and slaughter their neighbor. It is a horrific aspect of humanity, but it is also the reason I have a job—our undying belief in stories, particularly stories told in the right way. And if anything, the Yugoslav War was a masterclass in nationalistic storytelling. I get chills listening to both of these songs thinking they were written at one point in history and then rekindled for a very different purpose much later. "Zajdi, Zajdi, Janso Sonce" and "Ajde Slušaj, Slušaj Kaleš Bre Andjo"
(p. 218 & 244) Two beautiful Macedonian folk tunes played by the busboy Eder in Belgrade. Balkan folk music is a vast genre that is so rich and beguiling and these two songs break my heart with their thousand-yard melancholy and irreducible wisdom. I listened to them a lot trying to conjure inheritance, perseverance, loss, love. (p.243 & 274) Another old folk song, "Stani, Stani" was a critical genesis for the book. I first heard it when watching Emir Kusturica's Underground, a bonkers film that blew me away with its seductive cocktail of black humor, frenetic glee, and constant brass. What kind of culture could produce such a document that was on the one hand totally dismissive of history and yet also so clearly damaged by it? In particular, the scene where Lazar Ristovski's Blacky mourns the death of his wife during childbirth by singing this song, serenaded by the ever-present horns behind him as glasses shatter and people weep and violence is always just brewing beneath the surface—this wonderful moment of inter-possibility was something I wanted to constantly strive for in the book. It is not an accurate depiction of life; it is a kind of Balkan commedia dell'arte, but it strikes me at the same time as very true. Someone from Belgrade once said to me about something else entirely but it seems applicable here: "This is not how it is, but this is how it should be." (p. 240) Oh Tito, Tito, we hardly knew you. (p. 352) The Boss is, of course, essential reading for any New Jersey tale. I think his storytelling is actually underrated. Growing up, we had the Bruce Springsteen and the E Street Band Live/1975-85 on vinyl and I think the extended intro of "The River" was one of my first encounters with a story that went nowhere but also went everywhere. It's a perfect song for this novel…the image of the river is central to the novel and the notion of all rivers being the same river and also a river never being the same river draws together the three main strands of the narrative. (p. 413) "Eugenia bristled but said nothing. Leila, aware that she was being sheltered, resorted to her nervous habit of turning her wedding ring in circles. Jean-Baptise rose from the table and switched on the Zenith. A symphony from Schubert came on, full blast. The strings pulled and churned. The radio had become an instrument of retaliation, a playground beyond his mother's perception." (p. 426) Is there a more perfect song? I find this scene one of the most heartbreaking in the book. (p. 492) I think I am not alone in saying that Cage is a huge artistic hero of mine. Where others have a picture of Chekov above their writing desk, I have a picture of Cage. He is the reminder to never settle, to always go for the more difficult choice, to trust the randomness on the page, to plum the depths of what's possible. His silence is our silence but we will never touch his silence. (p. 492) While this song is not explicitly mentioned in the text, it's a good example of the Khmer pinpeat band playing along to the Reamker epic, which is the departure point for Kirkenesferda's Cambodian performance in 1979. Should give a good sense of the lulling atonal lilt of the pinpeat. Makes me kind of dizzy upon intense listening. (p. 537) I went through a slightly obsessive Midnight Oil phase in the 1990s. Apparently so too did Ivan. I kind of miss the quasi-pretentious affected accent that certain lead singers used to take on, à la Morrissey. Feels like it doesn't happen much anymore (Future Islands?). I imagine Leif Christian-Holtsmark (from the book) looks a bit like lead singer Peter Garrett. I imagine if you combined all humans together he/she would look like a slightly darker-skinned Peter Garrett. (p.537) Did I mention that I Am Radar is simply a retelling of this song? (p. 567) Papa Wemba's many iterations over the years reflect the DR Congo's own tumultuous shapeshifting. He has fallen and risen and fallen again, been jailed for human smuggling, underwent a religious conversion in prison, spawned dozens of dance styles, adapted to the times and is currently a legend on the world music circuit. "Mea Culpa" was from his early Viva La Musica days in the late 1970s, following in the disastrous wake of Mobutu's Zairianization of the country. This is the song I imagine playing on the speakers at Chez Mamam in Matadi as the troupe zip by on Horeb's motorbike. (p. 584) "She fished a record from the shelf and put it on. The vinyl was in bad shape. The dust and scratches could be heard, but the singer was French and sang so beautifully that the three of them sat there in stunned silence, listening to the little miracles of heartbreak." (p. 618) For a wonderful primer on the Congo drum language, read the first chapter of James Gleick's amazing The Information: A History, a Theory, A Flood. Freeman Dyson has a nice piece on the book in the NYRB: http://www.nybooks.com/articles/archives/2011/mar/10/how-we-know/ But what struck me as so poetic about the drum language and indeed most of coded information was that to get more specific you need to actually talk around your message—you need to create this cushion of filler information that protects those couple of fragile truth morsels. This is a perfect analogue to the novel. We create the whole trappings of this invented world—the sets, the characters, the dialogue, the stakes, the climax, the denouement—all so that we might convey one or two little precious moments that could've just as easily been expressed in a poem. What to make of the ratio between abundant context (99%) and these fleeting glimpses of the sublime (1%)? I don't know, but the disparate percentages inherent in novels, the soft pacing between the everyday and the ecstatic, has always felt more akin to real life to me than any other form of meaning-making.